Two years of research and development using a 'outside the box' approach to scenery design has produced a revolutionary scenery development system whereby high performance and low resource consumption is the standard. XpressSim products do not consume resources like scenery products of the past. Scenery created with Scenery Solutions proprietary XpressSim technology offers a groundbreaking balance of detail, great performance and outstanding value. All XpressSim products will be priced at a very affordable range of $1.99 to $5.99 per product. Product locations can be reviewed prior to purchase and then directly obtained and installed all from within the XpressSim user interface. Individual XpressSim products include a variety of locations. Island getaways, large Cityscapes and detailed airports with surroundings. Individual airport products expand past the runway and terminals into detailed terrain and building renders that encompass the airport region. Detailed Cityscapes can include tens of thousands of custom buildings with customizable product configurations from within the XpressSim interface. The XpressSim interface can manage product configurations across individual or combined FSX, FSX-SE and Prepar3D systems. The system is free to download and currently comes with 2 free scenery areas for your unlimited evaluation and enjoyment, and with no purchases necessary. Our free products provide a great introduction to our new system. Scenery Solutions is committed to releasing 1 or 2 new scenery locations on a weekly basis and will continue to provide more and more 'unlimited use' free products as time goes on. Over time our catalog accessed directly in the interface will grow immensely. All products are designed to work seamlessly with our original Ultimate Terrain line. Texturephoto terrain that has photoscenery-like accuracy, but utilizes vibrant textures that more closely match surrounding landclass in tone. All with full seasonal and night support. Custom models are created from extruded building footprint data. Buildings are appropriate sized and positioned according to their real world locations using a regionally appropriate texture. Accurate coastlines, roads, railroads, etc. Accurately placed autogen vegetation in their real world locations (i.e. trees and shrubs). High resolution, upsampled Terrain Elevation Mesh. Accurate placement of detailed models with custom textures, where appropriate. Large, extended area of custom, hand-classified landclass outside of detailed scenery area. Despite the detailed scenery, XpressSim products have been designed from the ground up to give terrific performance with a minimal amount of memory usage (VAS). Accurately positioned airport runways, taxiways and aprons. Custom ground markings on airport surfaces. Custom placed centerline, edge and spot lighting. Gander International Airport is operated by the Gander International Airport Authority. Canadian Forces Base Gander shares the airfield but is a separate entity from the airport. 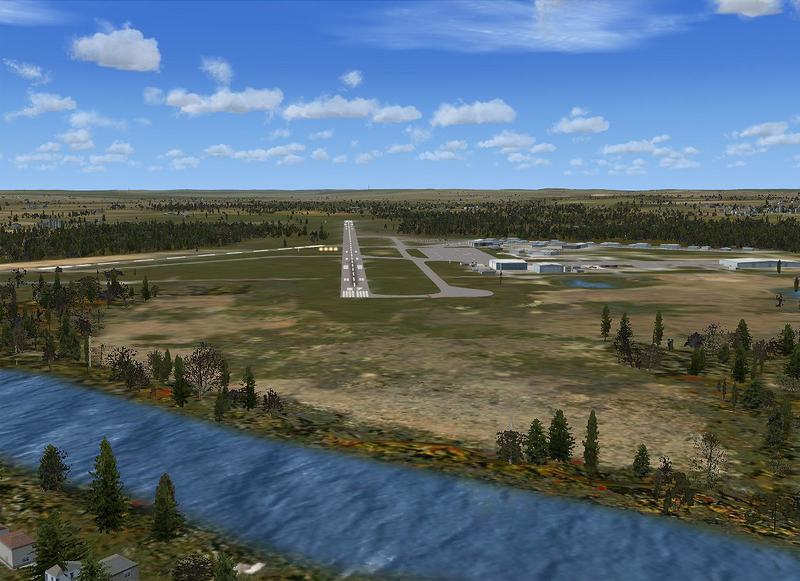 Gander has two long, active runways capable of handling large aircraft. Gander International and the people of Gander are famous for Operation Yellow Ribbon. On 9/11/2001, with United States airspace closed due to the terrorist attacks, Gander International played host to 38 airliners, totaling 6,122 passengers and 473 crew. To honour the people of Gander and Halifax for their support during the operation, Lufthansa named a new Airbus A340-300 "Gander/Halifax" on May 16, 2002. St. John's International Airport CYYT is an international airport located 3 nautical miles (5.6 km; 3.5 mi) northwest of St. John's, Newfoundland and Labrador that serves the St. John's Metro Area and the Avalon Peninsula. The airport is classified as an airport of entry by Nav Canada and is staffed by the Canada Border Services Agency (CBSA). The airport was also designated as one of five Canadian airports suitable as an emergency landing site for the Space Shuttle orbiter.This scenery contains the airport grounds, plus the surrounding airport region including over 5600 custom placed buildings. The nearby city of St Johns is available as a separate product called St John's Cityscape. Peterborough is known as the gateway to the"cottage country", a large recreational region of the province. Peterborough Airport (CYPQ), is located 3 nautical miles (5.6 km; 3.5 mi) south-southwest of the city of Peterborough, Ontario, Canada. The airport includes a main 7,000 by 100 ft (2,134 by 30 m) asphalt runway oriented east-west, and a smaller 2,000 by 49 ft (610 by 15 m) paved (2014) runway oriented northwest-southeast. A new terminal building was built in 2011. The airport is classified as an airport of entry by Nav Canada and is staffed by the Canada Border Services Agency. Florence Airport, Peretola ( LIRQ) is the international airport of Florence, the capital of the Italian region of Tuscany. It is the second-busiest Tuscan airport. Florence Airport is small, with a single runway, and the main taxiway is situated at the end of Runway 5, with an overshoot/holding area at the end of Runway 23. As is common at smaller airports, after landing, planes turn around at the end of the runway, then taxi back down to reach the parking area and terminal. Because of the close proximity of Monte Morello, planes normally take off from Runway 23, thus forcing aircraft to taxi down the runway again to depart. Lots of extended, scenery around airport !Note: Due to complex taxiway paths in main terminal area, progressive taxi may not work perfectly. Florence, capital of Italy's Tuscany region and birthplace of the Renaissance, is home to masterpieces of art and architecture. One of its most iconic sites is the Florence Cathedral, with its terra-cotta-tiled dome engineered by Brunelleschi and bell tower designed by Giotto. 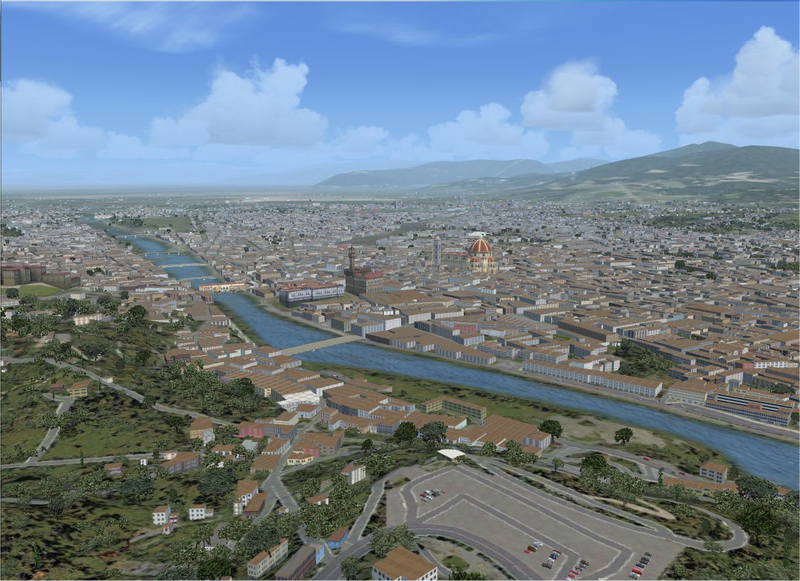 You can now experience one of the world's most picturesque cities in your Flight Simulator environment.The accompanying Florence airport region can be found in the LIRQ product. Ajaccio, the largest city on Corsica. The original city went into decline in the Middle Ages, but began to prosper again after the Genoese built a citadel in 1492 to the south of the earlier settlement. The most famous Ajaccien is Napoleon Bonaparte who was born in Ajaccio in 1769, and whose ancestral home, the Maison Bonaparte, is now a museum. Ajaccio Napolean Bonaparte Airport is the main airport serving Ajaccio on the French island of Corsica. The airport is the main base of regional airline Air Corsica, which operates services to Metropolitan France. This beautiful scenery is massive and covers the entire seaside area for the Bay of Ajaccio. 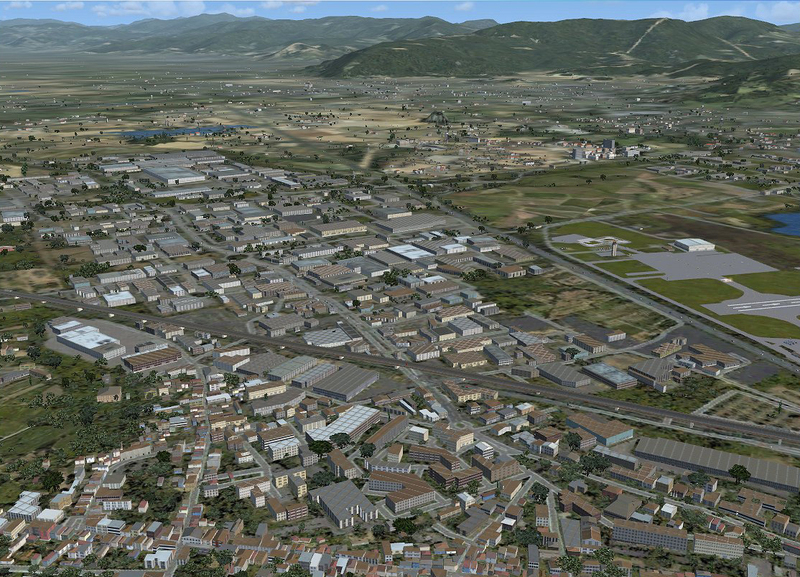 Over 13,000 custom objects are included in this stunning scenery, plus a detailed version of the LFKJ airport. Enjoy! Corsica's rugged coastline is a major driver for tourism. The town of Propriano is a port city and cruise ship stop.This scenery includes the scenic city of Propriano, plus the local airport LFKO.The nearby Ajaccio Region, with LFKJ airport, makes a great companion to this product and a really nice regional flight. A Coruna Airport (LECO) is the airport serving the Galician coastal city of A Coruna in northwestern Spain. The airport is located in the municipality of Culleredo, approximately 8 km from the city center. In 2015, the airport recorded 1,025,688 passengers, 14,682 flight operations and 141 tons of cargo. This scenery contains a 5m mesh. 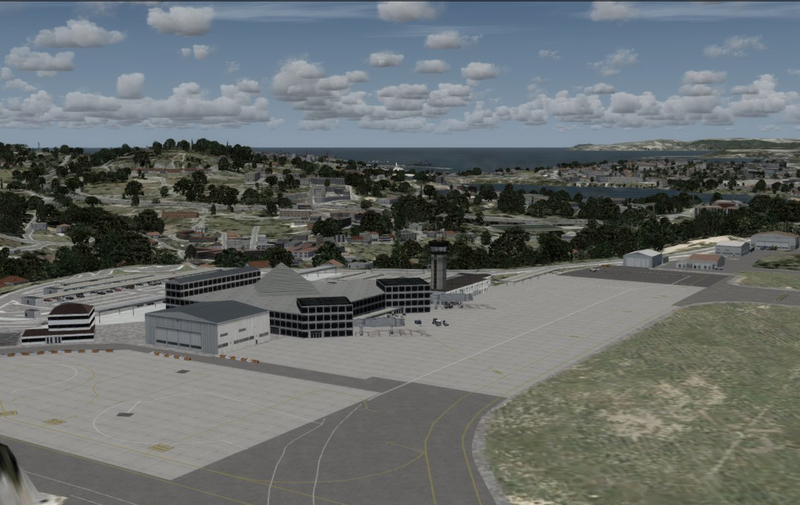 It is recommended that yoiu set your FSX/P3D mesh resolution slider to 5m or better if possible.Make sure to get the gorgeous A Coruna Cityscape Demo to go with this airport! Situated beside the Atlantic Ocean on a promenade, A Coruna is a historic Galacian port city locaced in Norwestern Spain. The city history has maintained close links with its old fishing and commercial port. The peninsula on which the Old City stands also contains the Tower of Hercules, one of the symbols of the city.The 'A Coruna' airport region is available to compliment this product. See the LECO scenery. Duluth is a major port city in the U.S. state of Minnesota and had a population of 279,771 in 2010, the second-largest in Minnesota. Situated on the north shore of Lake Superior at the westernmost point of the Great Lakes, Duluth is accessible to oceangoing vessels from the Atlantic Ocean 2,300 miles (3,700 km) away via the Great Lakes Waterway and the Saint Lawrence Seaway. Duluth is a tourist destination for the Midwest.This scenery also includes the scenic Sky Harbor Airport and Seaplane Base (KDYT), which is located near the Wisconsin border, between Superior Bay and Lake Superior.To complete the regional scenery, also see Duluth International Airport Region DLTH and Superior (Wisconsin) Cityscape And Airport (KSUW). 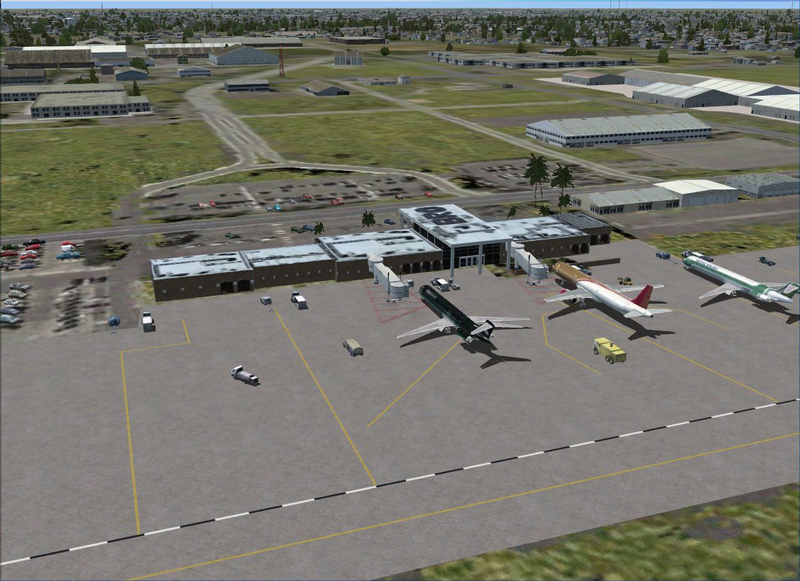 Duluth International Airport is a city-owned, public-use, joint civil-military airport located five nautical miles (9 km) northwest of the central business district of Duluth. It is mostly used for general aviation but is also served by three commercial airlines. It is the third-busiest airport in Minnesota. On October 30, 2015, a new terminal opened. The new terminal are is included in this scenery.This scenery includes both the International Airport and a large portion (64km) of the surrounding region. For extended coverage in the area please see the "Duluth Cityscape and KDYT" product. To complete the region, also see "Superior City And KSUW". The latter covers the city of Superior, Wisconsin which is just across the bay from Duluth. Superior is at the western end of Lake Superior in northwestern Wisconsin. Bordered by Saint Louis, Superior, and Allouez bays, the city is framed by two rivers: the Nemadji and the Saint Louis. Superior and the neighboring city across the bay, Duluth, Minnesota, form a single metropolitan area called the Twin Ports. They share a harbor that is one of the most important ports on the Great Lakes.Richard I. Bong Airport (KSUW) is a city owned public use airport located three nautical miles (6 km) south of the central business district of Superior, a city in Douglas County, Wisconsin, United States. It has two asphalt paved runways: 4/22 is 5,100 by 75 feet (1,554 x 23 m) and 14/32 is 4,001 by 75 feet (1,220 x 23 m), all with approved GPS approaches. Brownsville, Texas is located at the southernmost tip of Texas, on the northern bank of the Rio Grande, directly north and across the border from Matamoros, Tamaulipas, Mexico. This scenery includes nearly the entire city of Brownsville, extending to and including KBRO airport.KBRO airport (Brownsville/South Padre Island International Airport) is located 7km east of the central business district of Brownsville. The airport is served by two commercial airlines, six air taxis and offers three fixed-base operations (FBOs) for general aviation. It is a convenient airport for flying into the Rio Grande Valley and northern Mexico. Kelleys Island is primarily a vacation destination and sees thousands of visitors each summer. Notable attractions include its various beaches, parks, and campgrounds. Several ferries provide regular transport for most travelers and the island features a number of marinas. It is the largest of the American Lake Erie Islands and is a part of the Sandusky, Ohio Metropolitan Statistical Area. Kelleys Island Land Field Airport (89D) features a terminal building, a single runway and a parking area for private planes.For scenic island hopping in the area, be sure to check out all the products: Put-In-Bay, Middle Bass Island, North Bass Island, Kelleys Island And Rattlesnake Island. Middle Bass Island is an island in the U.S. state of Ohio, located in Lake Erie. A small town, Middle Bass, lies on the island. The island is one of 3 Bass Islands located in the center of a group of 23 smaller islands. And, it is the location of the historic Lonz winery. The island is serviced by the Miller Boat ferry line. 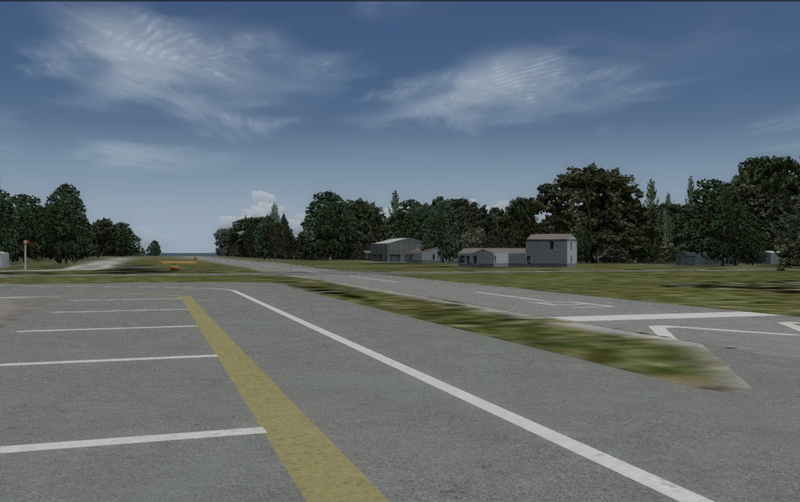 The Middle Bass island scenery includes both airports, including the main airport 3T7 and the smaller grass airfield 3W9. 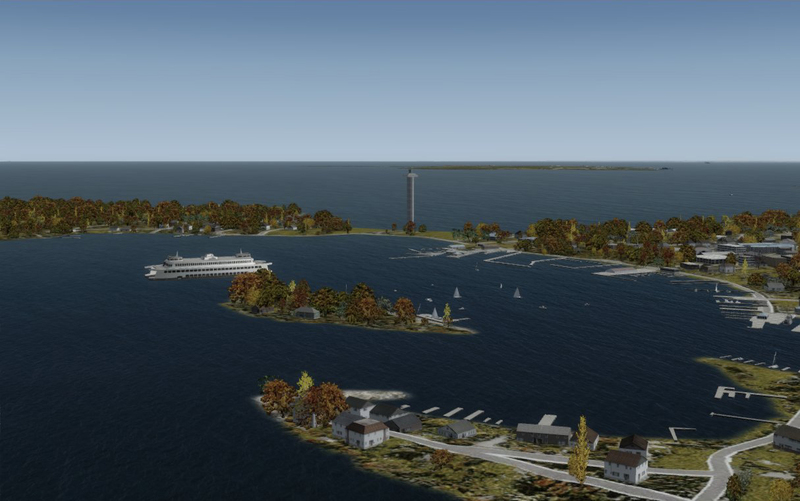 And, this scenery also includes the nearby smaller islands: Ballast and Sugar.For scenic island hopping in the area, be sure to check out all the products: Put-In-Bay, Middle Bass Island, North Bass Island, Kelleys Island And Rattlesnake Island. North Bass Island is an island of the U.S state of Ohio located in Lake Erie. The small unincorporated community of Saint George is present on the island. The 688 acre island is one of the few Lake Erie islands that has not been commercially developed. The state of Ohio purchased 589 acres (2.4 kmÂ²) of the island to preserve it from development and operates it as North Bass Island State Park. Historically, North Bass was mainly used as a vineyard. 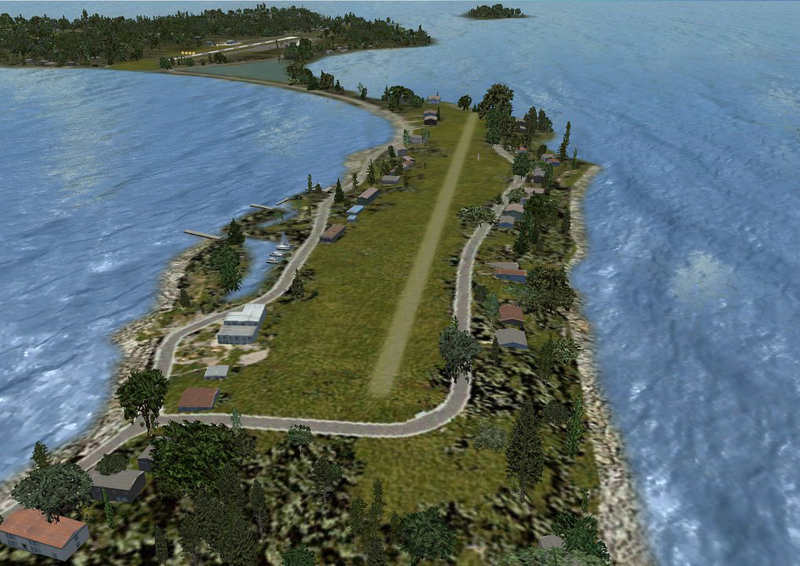 North Bass Island Airport, 3X5 offers a 1,804 ft paved airstrip. Put-in-Bay is a a popular summer resort village located on South Bass Island. Ferry and Airline services connect the community with Catawba Island, Kellys Island, Port Clinton and Sandusky Ohio. This product includes the scenic island of South Bass, Green Island, Starve Island and Put-In-Bay Airport (3W2). Put-in-Bay airport is open year round for arrivals and departures from dawn to dusk.Runways at 3W2 are modern and paved but not lighted. So, there are no departures after dusk. Be sure to remain at least 1000 feet from Perry's monument located 1.5 miles northeast of the field,For scenic island hopping in the area, be sure to check out all the products: Put-In-Bay, Middle Bass Island, North Bass Island, Kelleys Island And Rattlesnake Island. Rattlesnake Island is an 85-acre island located on Lake Erie near Put-In-Bay. It is one of several islands known as the Lake Erie Islands. The name Rattlesnake comes both from the actual rattlesnakes that used to inhabit the island, as well as from the overall shape of the island. Today, Rattlesnake Island is accessible only to the 65 members of the Rattlesnake Island Club. There are currently only about fifteen private and exclusive lots on the island. Sale of property on the island is controlled by the island club. 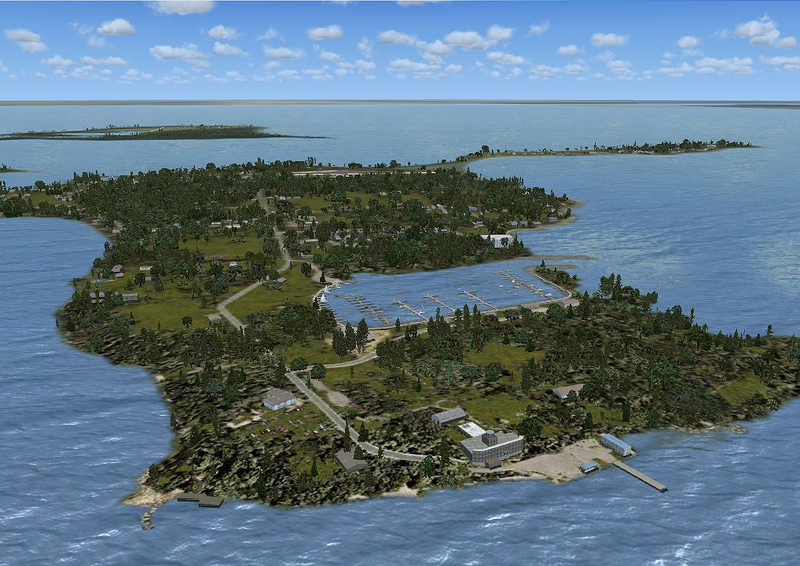 The island contains a small grass airfield 58OH.For scenic island hopping in the area, be sure to check out all the products: Put-In-Bay, Middle Bass Island, North Bass Island, Kelleys Island And Rattlesnake Island. Download and Discover our Scenery Today! Important: Because of the extremely low price of each region (some as low as $1.99), and because different regions are available for free so you can evaluate XPressSim, Flight1's 30 day refund policy does not apply to XPressSim purchases and all sales are final. Please take advantage of the unlimited use regions you can download now at no cost!